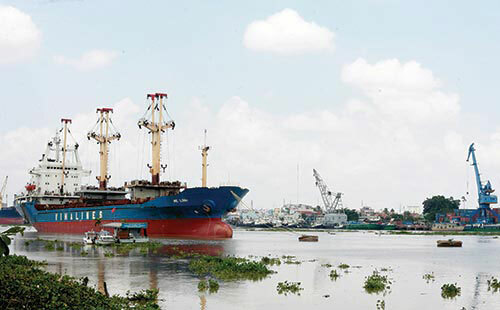 Similarly, Vinalines’ holdings in other ports including Can Tho, Nghe Tinh and Cam Ranh was proposed to be reduced from a current 75 per cent to 49 per cent, and the firm’s holding in Khuyen Luong and Nam Can ports would fall from 50-65 per cent to below 50 per cent. The MoT also asked for Vinalines to entirely exit Nha Trang Port JSC. Earlier, Vinalines claimed that the initial public offering (IPO) for its four major ports in Haiphong, Quang Ninh, Nha Trang and Danang had generated modest income, as only 5 per cent of the available shares were sold, a fifth of the target. Vinalines’ general director Le Anh Son attributed the poor IPO result to overly high state capital stakes in the firms, which had discouraged investors. Son expected that the shares in port businesses retained by Vinalines would become more appealing to investors if the MoT proposal to lower state ownership in these ports was approved. “Our firm expects to garner VND2 trillion ($96 million) to feed financial restructuring and at the same time bolster the management efficiency of these ports,” said Son. In parallel to lowering state ownership in port businesses, the MoT also proposed taking stronger action to deal with Vinalines’ underperforming member units. The MoT has proposed Ca Mau Shipbuilding Industry Limited go bankrupt, increasing the number of Vinalines’ members to go bust in the upcoming time to three, including Vinashinlines, Falcon and Ca Mau Shipbuilding Industry Limited. Three other members were proposed to be dismantled instead of divested from. They were Ben Dinh-Sao Mai Port Development JSC, Vinalines training college and ship repair firm Vinalines-Dong Do Limited. Loss-making Northern Shipping and Dong Do Marine will be downsized in terms of state ownership following a Vinalines proposal, with the state stake in these firms falling from above 50 per cent to less than half. According to Son, the three issues of foremost importance to Vinalines at present were market expansion, equitising the Vinalines parent company and debt rescheduling. In terms of debts, the company reportedly received approval from several creditors to convert its debts into creditor capital holdings in the company, a move that would offer the firm a new way out of its current problems.